Joel Schrenk begins his third season as head coach of the Cannon County Lions Thursday. District 8-AA coaches picked Cannon County to finish fifth of six teams in a preseason poll conducted by Murphy Fair for his 2011 Tennessee High School football publication. That's a fair assessment, based on last season's 1-9 campaign, but this is not last year and Cannon County expects to be a more competitive team in 2011. Though the Lions will feature a young squad with only seven upperclassmen (three seniors, four juniors), they appear to be deeper at the skill positions and numbers should limit the amount of time players have to go both ways. 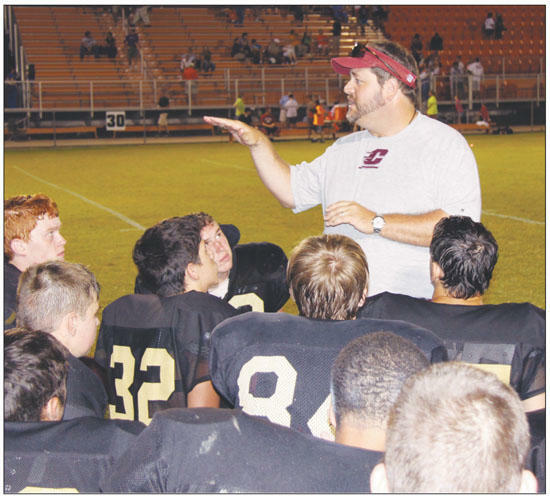 "We have looked at what we can do to get the best 11 on offense and on defense on the field and how can we limit the number of guys that are starting both ways," Cannon County third-year Head Football Coach Joel Schrenk said. "We have it down to only five guys having to start both ways, which is big for us. I would like that number to be two or three, but it is getting better. "We have more pieces and we have to find the right combinations for those pieces," Schrenk said. "I think we definitely have more weapons." Cannon County will have to experience growing pains along the way with the abundance of underclassmen who will have to play key roles. As many as four, possibly five, freshmen could eventually find themselves in starting roles and the sophomore class also features some of the squad's potential difference makers. "We are inserting some freshmen and we really have to get them coached up," Schrenk said. "It does not matter which grade the players are in because we are going to play the best guys." If the preseason serves as an indication then Cannon County appears to be much improved. The Lions have performed well in scrimmages. Defensively, the Lions are forcing turnovers and getting off the field. Most importantly, they are have not been the victim of the big play which so often hurt them a year ago. "I think there is a lot more intensity out here," said junior linebacker Ryan McLaurine, who also starts on the offensive line. "We have had productive practices and we have played better overall. I expect us to have a good year if we keep working hard and getting better. We have the potential to be a very competitive team this year." Cannon County's defensive backfield is more athletic in 2011 with Justin Tobin at safety, and Justin Weaver and Cody Petro starting at corners. The Lions will count on the trio to provide leadership for the younger starters and provide a last line of defense. They have proven they are up to the task. "I love playing the safety position and we have been better defensively in the scrimmages," Tobin said. "We have to be solid and get off of the field when we have a chance. Our offense can move the ball, but we need to get off the field and get the ball to the offense in good position to operate." The offense has been vastly improved this fall. Gone is tailback Gabe Walkup and his 1,000-plus yards and team-leading nine touchdowns; however, the Lions will look to make up for that loss with the combined production of Brandon James, Hawk Love and Jake Hoskins. Cannon County's offense will be guided a first-year starting quarterback in sophomore Ryan Jordan. Whether the unit has room to operate will depend heavily on the maturation of a young offensive line that will feature three underclassmen. Senior Thomas Stone and McLaurine anchor the line. Freshman Allan Robinson and sophomores Dalton Ryan and Bradley Gunter also will be counted on heavily. "The offensive line has to lead the way," Stone said. "We have to give those guys room to work because we have a chance to be a good offensive team and get into the end zone. It's up to us to lead them there." Cannon County's schedule also will be more conducive to its roster and classification in 2011. Gone are the Class 5A teams that littered the schedule the previous two years. The only Class 4A teams on the schedule are region opponents. Non-district tilts against Watertown, Chattanooga Grace Academy, Westmoreland, Cascade and Meigs County will allow the Lions to be more competitive based on similar numbers and depth. This does not mean the road is easier as the schedule is filled with several non-district playoff-caliber teams, as well as the always-tough District 8-AA gauntlet. It does mean Cannon County's players will have an opportunity to play teams on its level. "Our district is one of the toughest in the Midstate with several teams capable of making the playoffs," Schrenk said. "This year we are playing more non-district teams that are like us. This schedule will challenge us but it is a schedule that allows us to compete with teams at our level and that's a good thing." Cannon County opens the 2011 season at Watertown Friday. Kickoff is 7 p.m.